Many people have weight loss as their goal at this time of year. Over a third of North Americans will vow to “eat healthier” and/or “get more exercise”. While those are certainly good measures to take, most people fail within a few months (some even sooner!). The failure of these resolutions isn’t a big surprise. This modern world isn’t set up for you to lose weight. It’s conspiring to make you add FAT. If you’re outside your home occasionally and have at least some semblance of a social life, it can be tough. Think about the food temptations you come up against on a regular basis. There may be donuts or muffins in your office break room. You may eat out with clients or attend dinners as part of your work. Maybe you take your kids to events where food is offered. I’m sure you haven’t forgotten all those extra goodies available over the holidays either! I was at a birthday party for one of my son’s friends from kindergarten a couple of weeks ago. It was held at a trampoline park and the dozen or so kids had a blast jumping around for an hour. Pizza seems to be everywhere, especially in North America. Any time someone planning an event is looking for something cheap and easy, pizza seems to be the choice. Pizza for a team meeting? Pizza parties at school, university, or college? Pizza during a skate night or a ski day or while watching the hockey game (keeping this topical for winter)? Is pizza always a bad choice? Some homemade pizzas have less fat, more veggies and protein, and more fibre…which improves their profile significantly. A typical pizza slice is about 280 calories, 10 grams of fat, 36 grams of carbs, and 12 grams of protein, with only about 2.5 grams of fibre. If you only have one slice, it’s really not the end of the world either. But how many people eat just one slice? The main thing is that the rest of your day helps balance things out, by being lower in calories and carbs, higher in protein, and have more fibre. Vegetables and lean protein like chicken, turkey, fish, lean meat, and whey protein would help do the trick. As long as you make adjustments in the rest of your day (or the next day), then you can keep moving ahead with your fat loss goals. It’s a strategy I work on with my Online Coaching clients. Many of them spent time with other coaches or personal trainers that told them they were only going to be able to lose weight if they gave up all “junk” food (what I refer to as treats). Just avoid all of your favourite food temptations from the world and all will be well! Others were misinformed by some online “guru” that they had to give up certain foods (like dairy, wheat, gluten, sugar, alcohol) to get lean. And no, I’m not suggesting that you count calories for the rest of your life. The quantity of the food you eat, in both macros (protein, carbs, fat) and micronutrients (vitamins and minerals) matters. It’s not the whole story, but don’t think that you can ignore calories. Generally, whole and minimally-processed foods tend to improve your health and your waistline. Eating foods that are nutrient-dense like vegetables, fruit, nuts, eggs, lean meat, beans, whole grains and some dairy generally helps keep your calories and your appetite under control. It’s a lot easier to consume 400 calories worth of pizza than 400 calories worth of vegetables. For reference, 400 calories worth of broccoli is about 13 CUPS! 400 calories is about 7 apples. Either way, it primarily comes down to your calorie consumption. If all you ate was two slices of pizza a day, you would lose weight. I’m not suggesting this as a strategy, BTW, before you start touting me as the creator of the Two Pizza Diet. You would be way too low on protein, fibre, and vitamins and minerals for optimal health. I just want to point out that It’s not the pizza itself that’s the problem. Your overall calorie intake is what makes you lose or gain weight. It’s worth tracking what you’re eating for a period of time, and then devising a nutrition plan that makes sense for you from there. I help my Online Coaching clients do just that. We work together to create a nutrition system that works for the rest of their lives. My strategy with pizza is simple – I don’t eat it. I don’t really enjoy it and since I suffer from GERD, pizza is not the best choice for my stomach. My favourite treats are ice cream, cheesecake, brownies, and chewy freshly-baked chocolate chip cookies. Yes, I have a sweet tooth! Pick your treats and enjoy them without guilt. Don’t just eat it because it’s there. If you LOVE pizza, go ahead and have a slice. Be aware of the calories that you’re consuming and make adjustments as needed to the rest of your day (or the next day). That allows you to get lean while enjoying your favourite foods. That’s a nice life to be living. Over 35 and want to get leaner, healthier, and stronger? Yes, I know you're busy and have a family and social life. 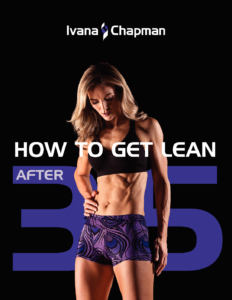 Sign Up & Get My FREE e-book with a 6-week workout plan to get you started! Sign Up & Get The E-Book! Ivana Chapman BSc BA CSCS is a Canadian fitness and nutrition coach, happy wife, and mom to an adorable 4-year-old boy. She is a writer, published fitness model, speaker, 3rd Dan black belt in Shotokan Karate, former World Cup Karate Champion, one-time marathoner, and CBBF National level Natural Bikini competitor. She loves weight training and chocolate, not always in that order of preference. Do You Really Need Superfoods? Can Donuts Be Part Of Your Nutrition Plan? Sign up to get my FREE Ebook! Want help getting lean, healthy and strong? BONUS: 6 Week Workout Program to get you started!